orihei UESHIBA, the founder of Aikido, also called O'Sensei (great master), created Aikido based on a thorough study of many different Japanese Martial Art schools. The important spititual influence in his combat oart is one element of its originality. The aim is to control the attack and not simply to destroy the opponent. Aikido techniques are particularly influenced by O'Sensei's study of Daito Ryu under the guidance of Sokaku TAKEDA. After the second world war, O'SEnsei settled in the Iwama countryside, and left his son, Kishomaru UESHIBA in charge of the Tokyo dojo (Aikikai). The concept of Takemusu Aiki appeared during this period. It is the stage were techniques are performed spontaneously, based on a mastery of the fundamental Aikido principles. When the basic principles have been fully assimilated, we can create a great variety of techniques whateer the opponent's movements or contact points. 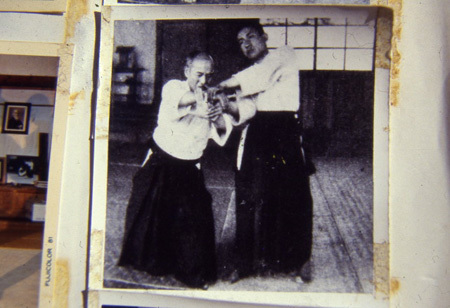 At this time O'Sensei perfected his weapon study (Aiki-ken and Aiki-jo) during his daily classes in the Iwama countryside, emphasising the link between weapon techniques and bare-handed techniques. Every bare-handed technique can be applied to weapon techniques. This is why Aiki Bukikai devotes a great deal of time to the study of Aiki-ken and Aiki-jo.